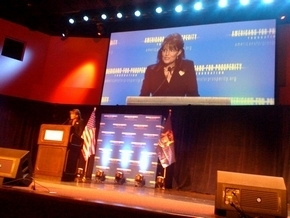 Governor Palin addressed a crowd of over 1100 in Clarkston, Michigan this morning at the “Defending the American Dream” summit sponsored by Americans for Prosperity. Sarah Palin saluted “the good folks of Michigan clinging to your guns and religion” at an anti-tax, anti-liberal rally here today. “This state is full of good, honest, hard-working Americans,” Palin said at Mt. Zion Church in Clarkston to more than 1,100 attendants at the “Defending the American Dream” rally put on by the Americans for Prosperity. She drew a standing ovation from her many fans in the cavernous church.